I was able to complete all 4 Breast Cancer Quilt tops with corner block borders this weekend. Now all that's left to do is to square up the tops again and then on to quilt sandwich assembly and quilting. Hopefully, each upcoming weekend I'll finish one quilt! I snapped photos of each quilt and merged them for a quick look. I was too lazy and kept each other quilt on the banister below each photo'd quilt and it caused it not to lay straight. So, they are cattywompus. I took each corner block and removed the stabilizer. The outside of the heart was really easy to remove the stabilizer but I could not get a grip of the inside stabilizer to get it started. Once it was started, it was easily removed. Finally came up with starting it with my seam ripper. Worked like a charm, but be careful. One time not paying attention and you have both the stabilizer and the fabric in one rip. 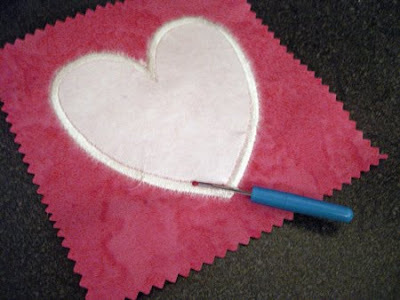 Happened to me and I had to go back to the embroidery machine and make one more puffy heart corner block. 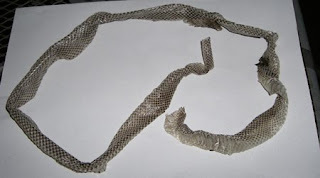 They are very useful eating bugs and mice etc. I would probably leave it alone as long as they aren't poisonous! The feel of snakes is totally different than expected. Very dry and cool to the touch. Still pretty yucky though! 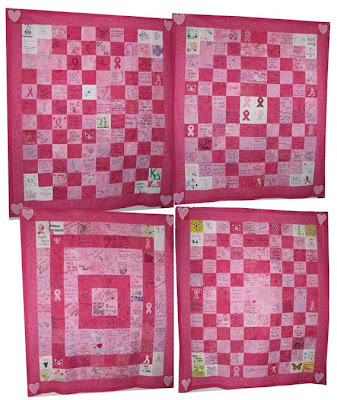 Oh your cancer quilts are lovely and so very generous of you to do. I love the colours so much.